Thurs 8 Nov: Will the Andrews’ Government ensure all Victorian children lives are free from violence? Body Safety Australia was excited to hear of the commitment from our local, state and national leaders to invest $6.2 million into Brunswick North West Primary School. As part of the school’s commitment to Respectful Relationships, Brunswick North West Primary School partnered with local not-for-profit, Body Safety Australia, to delivered consent and protective behaviours programs to staff, families and students over 2017 and 2018. Body Safety Australia co-founders have committed to strengthening this relationship by delivering a student co-designed project to ensure more gender-equitable access to play. Body Safety Australia is Victoria’s leading capacity building child abuse prevention education provider. Our work strongly aligns with the work of the Office for Women, the Office for Prevention of Family Violence, Respect Victoria, the Department of Health and Human Services, and the Department of Education under a Labor Government. In fact, Body Safety Australia was recognised by the Department of Health and Humans Services in the 2017 Victorian Protecting Children Awards. In the same year, the Office for Women invested heavily into developing co-founder, Whitney Yip’s leadership development, awarding her a scholarship to the 2017 Joan Kirner Young and Emerging Women Leaders program. There is a strong body of evidence that Body Safety Australia’s programs are effective in helping schools meet Child Safe Standards compliance. Additionally, the organisation has proven successful in increasing teacher confidence and capacity in rolling out Respectful Relationships education. Our whole-community engagement model has also widely empowered parents and carers in creating positive change. 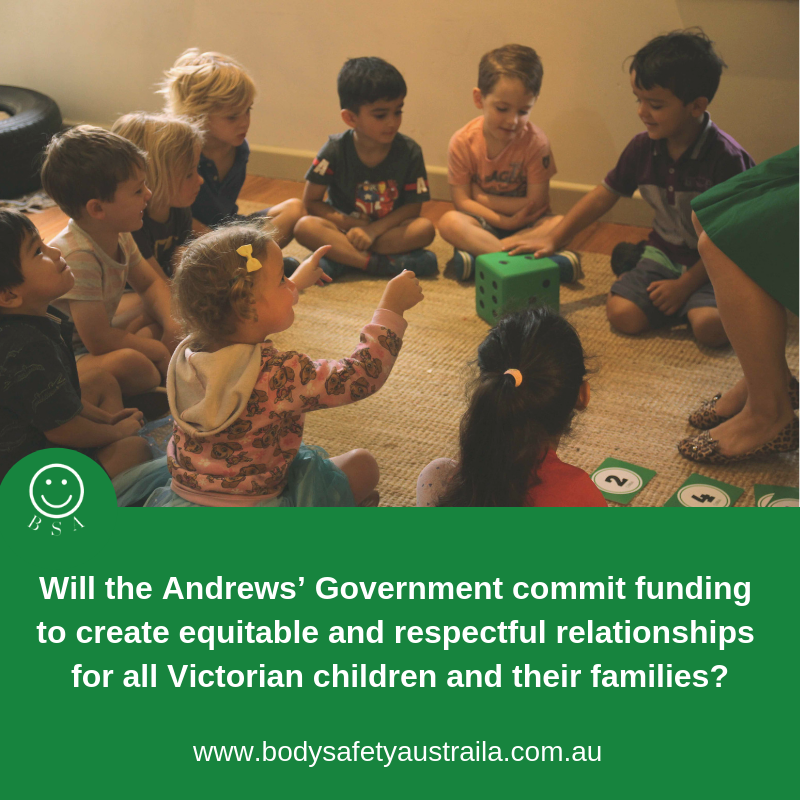 Will the Andrews’ Government now commit to funding our evidence-based program to support all Victorian teachers to have the knowledge, skills and capacity to ensure Victorian children lives are free from violence? Body Safety Australia has been featured and quoted in various media, and has published articles in print media. See our full list here. I just wanted to thank you for the wonderful work you have done with the children, families and educators at Minimbah. The feedback from our families about the program has been very positive and our work with you has also provided us with a wonderful provocation for reflection and discussion as a team of educators. The children have embraced the concepts covered in your sessions and we are gradually trying to build learning around emotions, assertive language, consent and permission into our program to scaffold and support the children’s learning. It is never a child or victim’s responsibility to protect themselves from abuse. We support communities in preventing abuse and help create generational change where sexual and gendered violence is no longer normalised. 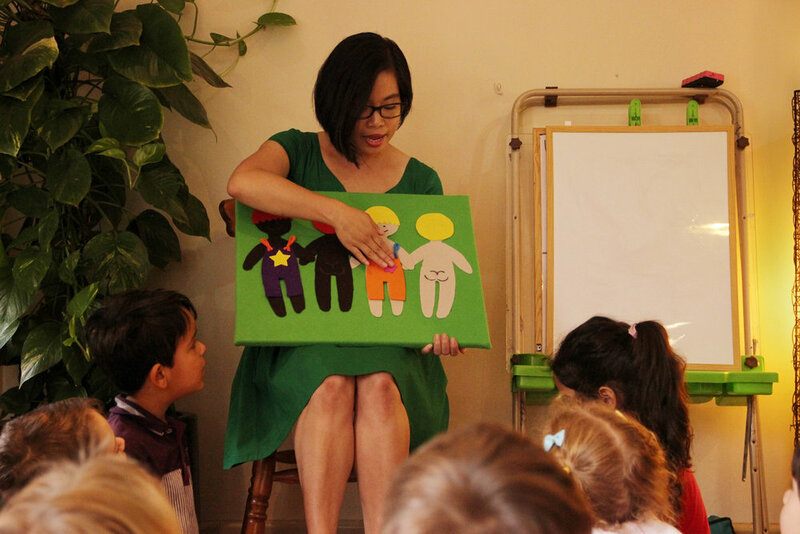 Co-Founder Whitney Yip introducing consent with Huggtopus at Bridge Road Early Learning Centre. Bridge Road Early Learning Centre children engaged and participating in Body Safety Australia's Body Safety Superstars 4yo program. Co-founder Whitney Yip introducing and identifying 5 Safe Adults using Body Safety Australia's handmade felt finger puppets. Co-founders of Body Safety Australia, Whitney Yip and Deanne Carson at Bridge Road Early Learning Centre. Body Safety Australia launch. Children at Bridge Road Early Learning Centre learning the difference between public and private body parts with co-founder Whitney Yip. Max discussing consent with co-founder Whitney Yip and Huggtopus. Children at Bridge Road Early Learning Centre listening to 'Surprise! Mum's Birthday' to learn the difference between secrets and surprises.